In this tutorial, a temperature sensor (MCP9700 linear active thermistor IC) and LCD are connected to the Arduino. The Arduino reads the temperature from the MCP9700 on analog pin A0 and displays the temperature on the LCD. This video shows the circuit operating. When touched with a finger, the temperature sensor IC will measure an increasing temperature which is displayed on the LCD. 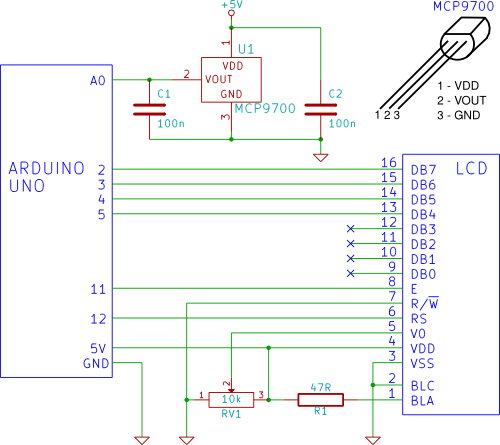 Also see the Arduino serial thermometer tutorial (Tutorial 15). Complete Tutorial 12: Arduino LCD before attempting this tutorial. The MCP9700 IC is housed in a TO-92 package (it looks like a transistor). The pinout of the package is shown in the circuit diagram. Capacitors C1 and C2 are used to stabilise the output from the MCP9700 and stabilise the power to the MCP9700. Follow tutorial 12 to interface the LCD to the Arduino. Connect the MCP9700 to the Arduino A0 pin as shown in the circuit diagram (pin 2 of the MCP9700 connects to A0 on the Arduino). Pin 1 of the MCP9700 (marked VDD) is connected to the Arduino 5V pin via the breadboard. The GND pin of the MCP9700 is connected to one of the Arduino GND pins. Click the picture below for a bigger image of the breadboard circuit. 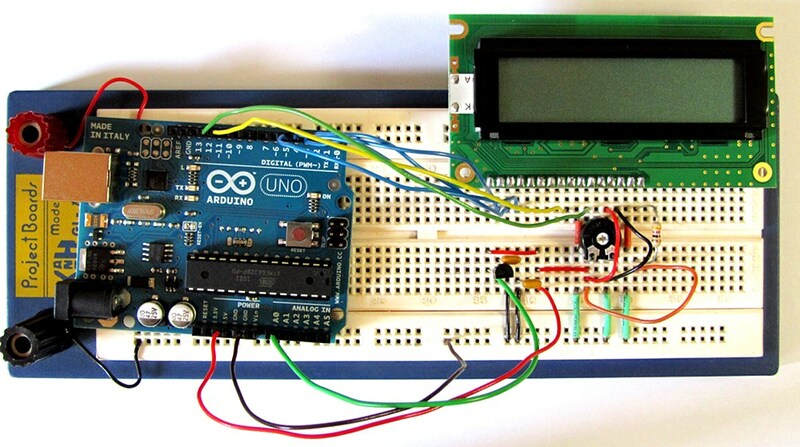 Copy the sketch for the Arduino LCD tutorial (below) and paste it into the Arduino IDE. LCD (16 character by two line). With the LCD_temperature sketch loaded into the Arduino, the temperature should be displayed on the top line of the LCD. Touching the MCP9700 temperature sensor will cause the displayed temperature to increase if the ambient temperature is below the temperature of your fingers. The temperature is displayed in degrees Celsius (°C).